We are excited to have your student in our Blair Oaks Elementary school community! Blair Oaks Elementary Home & School supports quality public education for each child by providing programs, support, advocacy, and fundraising that bridge the huge gap between public funding and the true cost of the full educational experience for each child. We are comprised of parents, teachers, administrators and volunteers that love to support our school and, in effect, our community. Anyone is welcome!!! Quarterly Meetings are held where families attend a short meeting followed by a fun activity involving parents and children. Fundraisers are sponsored by the Home & School including the Great American Fundraiser, Valentine's Sales, Father/Daughter Dance, and Spring Carnival. We are BOX TOP collectors. These funds are set aside to pay for the transportation to and from field trips for EVERY class. 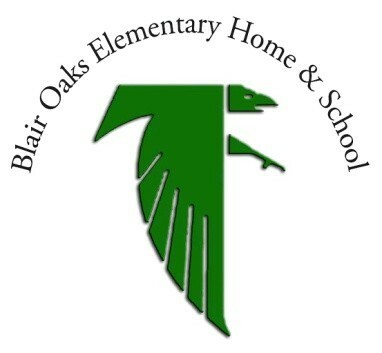 We are the go-to people for Blair Oaks Elementary apparel, accessories, etc. Home & School supports the school and students by sponsoring Character Plus Shirts, Classroom Needs, Field Day, Field Trips, Playground Equipment, and Technology Advancements. You are vital to the success of our organization. You can HELP by volunteering in fundraising campaigns, collecting box tops, and by showing your children that the quality of the environment they study in, is important to Mom and Dad!! !